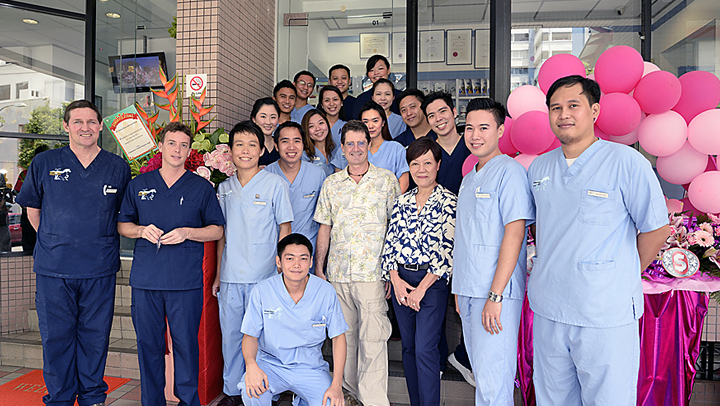 In 1989, after 5 years of living and working in Singapore, a somewhat reluctant Dr. Shane Ryan, an Australian, was convinced by friends and clients to start his own veterinary clinic in Singapore rather than return to his homeland. “Companion,” as we are commonly known, is situated approximately in the center of the small city-state of Singapore. The hospital is well-equipped with: separate cat and dog hospital wards (and waiting areas); an ICU/treatment ward; digital radiography; ultrasonography; echocardiography; in-house laboratory facilities; 3 surgical rooms, with an orthopedic suite; and endoscopic surgery facilities, to name a few of its features. 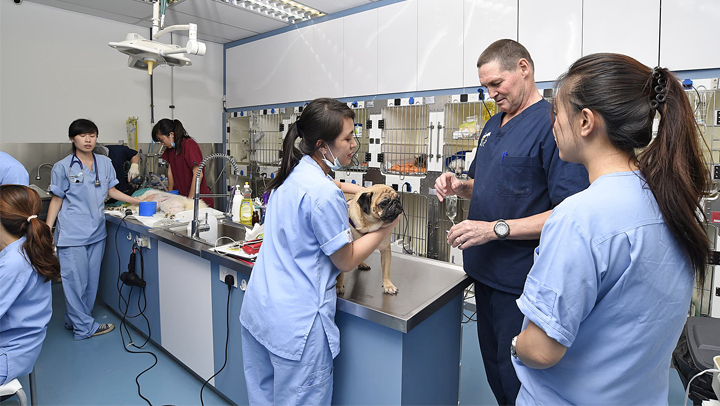 We also provide 24-hour emergency and referral care for other clinics around Singapore with a full veterinary and nursing team on duty throughout. 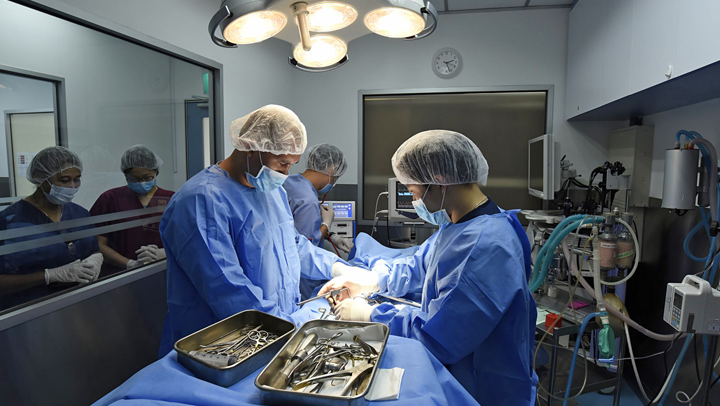 Singapore has no veterinary school; all licensed veterinarians are trained overseas, mainly in Australia, New Zealand, the United Kingdom, and, to a lesser extent, North America. So although we have highly qualified veterinary professionals here, there is minimal opportunity for specialist training. For much of our continuing education needs (compulsory for biennial relicensing) and more advanced training, our team members head off-shore. Until recently, more advanced laboratory testing specimens were sent overseas. For example, most of our histopathology was sent to Canada. 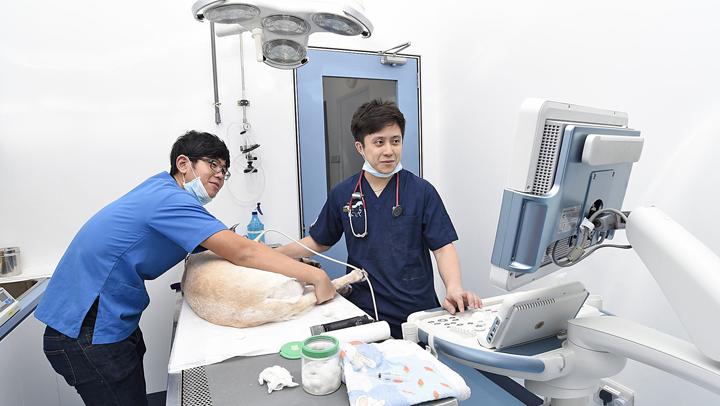 The recent arrival of a board certified veterinary pathologist in Singapore means some of our diagnostic needs are being met locally. The majority of Singaporeans are high-rise dwellers as Singapore is densely populated. In most circumstances, government regulations restrict the size, type, and number of pets that can be kept in a household. So although we see some large breeds of dog from owners in landed properties, smaller dogs and cats are more common at the clinic—some 50 to 60 cases daily. Due to the fast pace of life in Singapore and paucity of space, other species (eg, hamsters, gerbils, rabbits, birds) are also becoming increasingly popular as pets. The “typical” pet owners in Singapore are young, relatively affluent, and often treat their pets as integral members of the family. Clients tend to stay up-to-date with their pets’ annual examinations and comply well with vaccination, heartworm, and other parasite prophylaxis. Pet owners are also mostly prepared to follow treatment and surgery recommendations. In general, veterinarians are highly regarded and respected. In recent years, however, there has been a substantive increase in the number of animal welfare/rights groups that are more frequently and forcibly dominating the animal welfare debate. 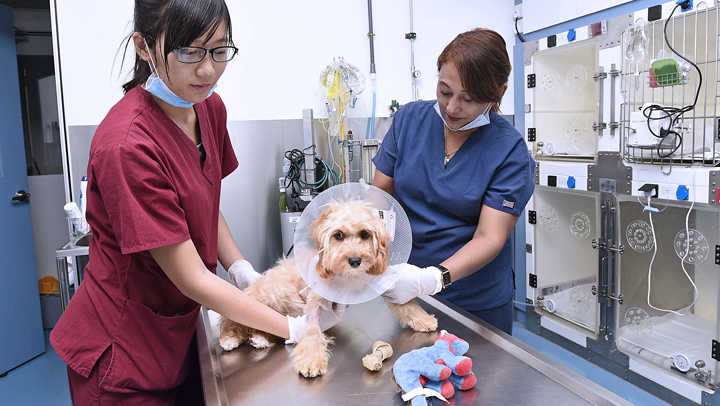 The profession, through the Singapore Veterinary Association, along with the government, is encouraging veterinarians to be the proponents of animal welfare and present a measured, nonconfrontational, scientific approach to animal issues. We see a wide range of conditions. Dermatologic complaints are common as the climate here is hot and humid every day of the year. Atopic dermatitis, acute pyodermatitis, and various types of otitis are among the most frequent. Ticks represent the biggest parasitic problem, and tick-borne diseases such as babesiosis, ehrlichiosis, and anaplasmosis are common. Heartworm is now rare, unlike 30 years ago when >25% of dogs seen at the SPCA tested positive. This is partly due to prophylaxis and partly to the government’s intense mosquito- control programs in place to minimize dengue fever (and other arbovirus infection) in the human population. The past coupling of heartworm with intestinal parasitic preventatives has also meant a substantial decrease in intestinal parasitism, especially ancylostomiasis, which was once a prevalent disease. Another common and painful occurrence in Singapore is severe edematous conjunctivitis, keratitis, and uveitis in dogs that encounter a black spitting cobra in the garden or on their walk. Immediate flushing of the eyes with cool water, followed by treatment and observation in the clinic, is recommended. 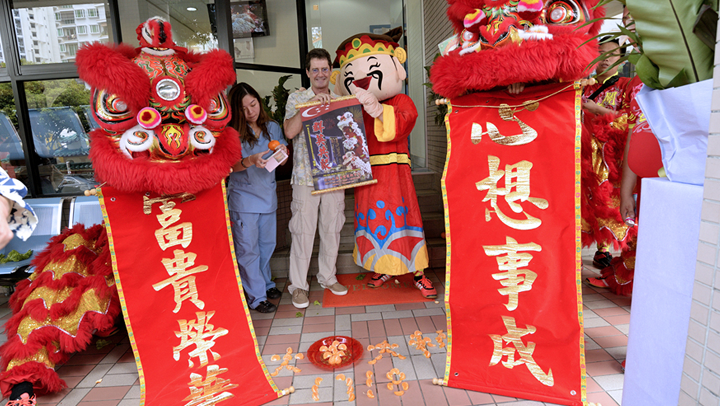 Singapore is fortunate to have been rabies-free for more than 60 years. Strict quarantine measures are in place to help prevent its reintroduction into Singapore, and recent cases of the disease across the causeway in Malaysia are viewed with concern. 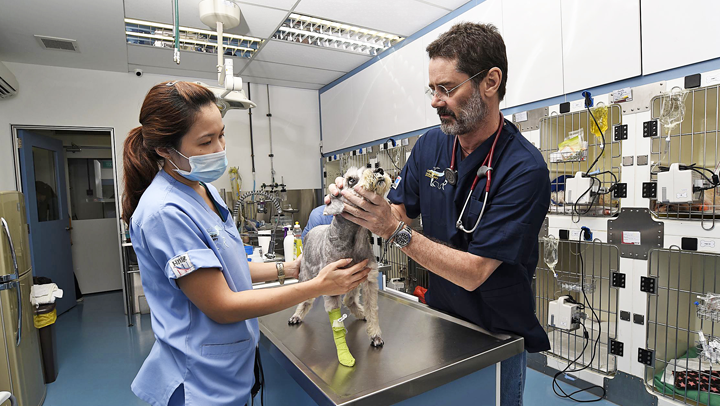 While getting high-quality CE can be difficult in Singapore, Companion has reached out through the Federation of Asian Veterinary Associations to provide 3- to 4-week externships for groups of veterinarians from Bali and Myanmar. It is gratifying to see the Balinese veterinarians in turn reach out to veterinarians from Timor Leste and help them further develop their clinical skills. At Companion, our goal is to be a cohesive veterinary team providing full and best-quality veterinary service for all pets all day, every day. We pay special attention to animal welfare and wellness, thus ensuring each and every pet gets the full love and compassion it deserves.